We have had beautiful weather here in my part of Ohio. It’s tempting to work outside all day, but it’s also cool enough to sew, so I had a personal sew-in this weekend. Just a little change in the numbers this week. I purchased a yard of red and white striped fabric that will make good bindings. 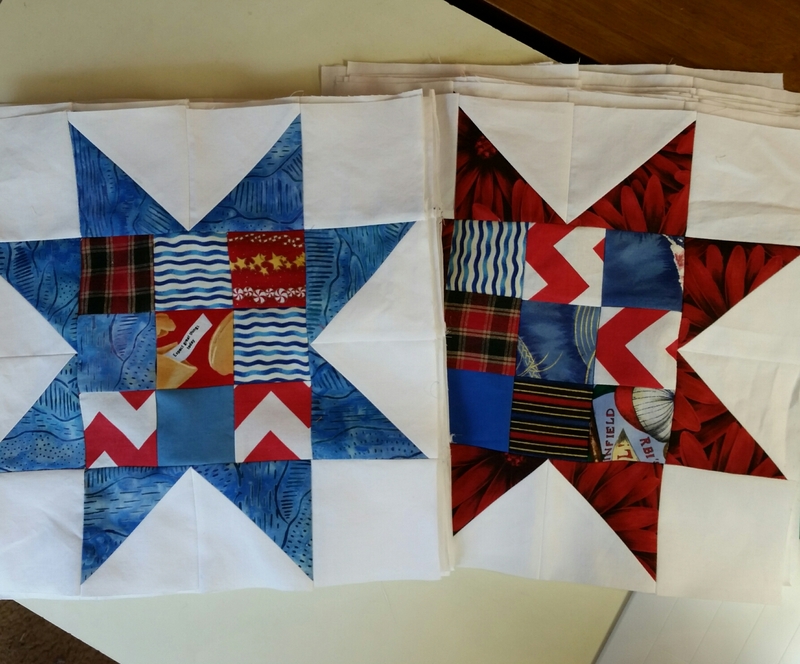 Then I used two and a half yards to make these blocks for Kat’s July/August block drive (if July got away from you as it did me, you still have a month to make any kind of star blocks in red, white, and blue. I love seeing fabrics from past projects as I make donation blocks, buts here’s a take on the way others may view your scraps. Creeping along, but I’ll get to 50 yards. Are you using your stash? Hope you’ve been enjoying Palindrome Week- every date this week is palindrome! No fabric was purchased, and I completed this baby quilt, so there’s a little progress. You know all that progress I had been making on destashing? It went out the door this week. I guess it could have been worse, since I was shopping at the fabulous Fabric Shack. And they’ve just opened a new annex.. 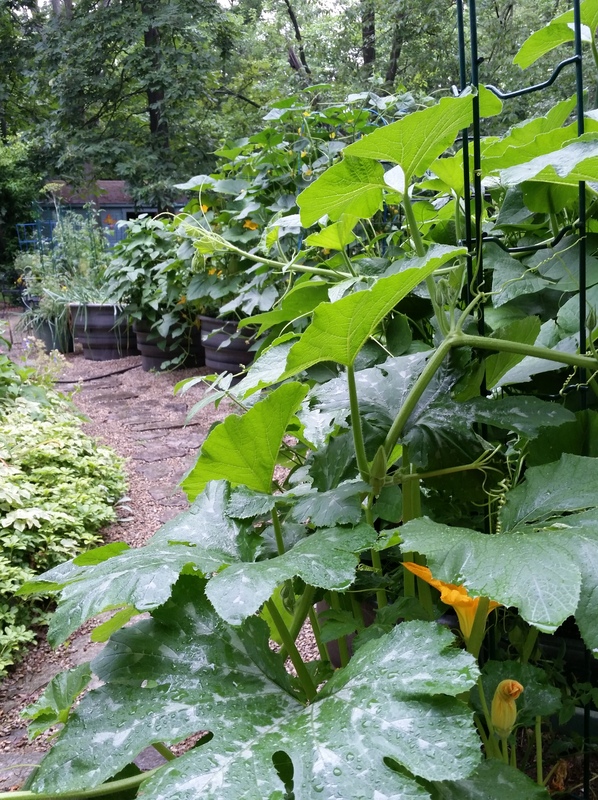 So I limited myself to these…17…yards. I went for a few basics (the best prices on Kona solids), but also found the sale fabrics at the bottom of the photo for backs to a couple of current projects. They’ll all get used pretty soon. And I have half the year left to reduce my stash! Here’s a photo for you, in case you have too much color in your life. Either it’s raining cats around here, or Yuri hopes he’s camouflaged while waiting for a chipmunk to come by. Good luck on sewing up your stash! Categories: Stash | Tags: Evening in the Garden, fabric shack, Valerie Root, Yuri | Permalink. I hope you all had a great weekend including those of you in the US, who were BBQing, parading, fireworking, etc. I was tired from the extended weekend, and didn’t have firm plans to sew, until I saw Christa’s post this morning about her HST Remix. 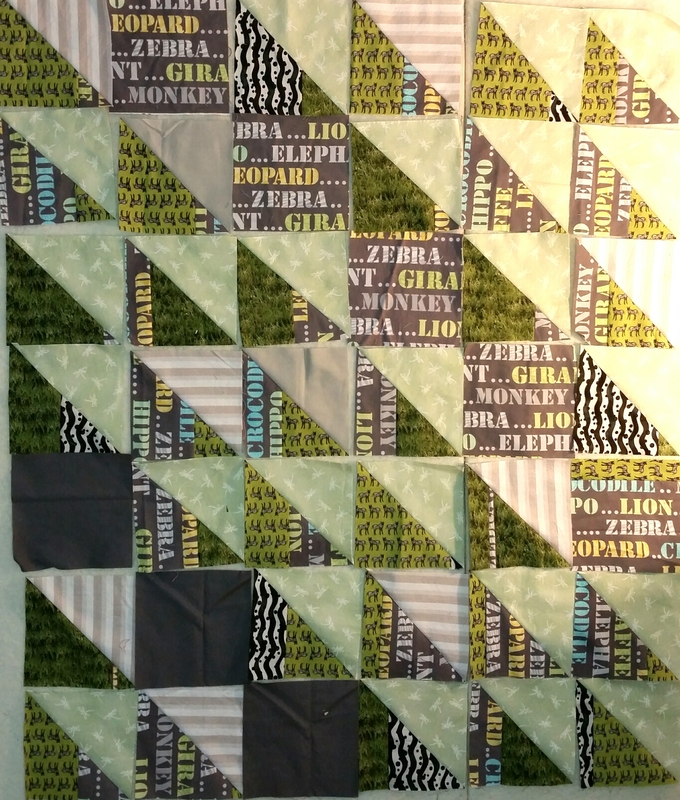 Her scrappy half square triangles were exactly what I needed to turn the last of my zebra scraps into one more baby quilt! 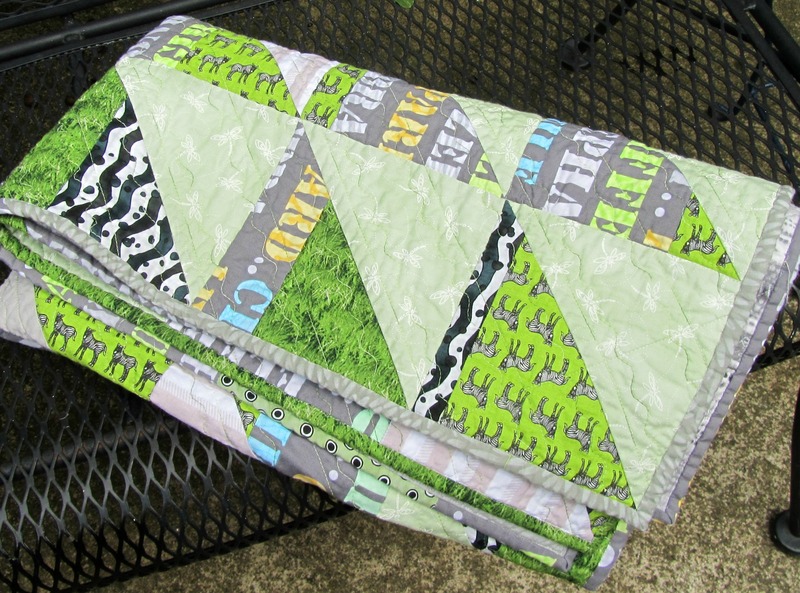 I’ve pieced triangles before, out of necessity, but always with the same fabric. I don’t know why it never occurred to me make them scrappy! So I shamelessly stole Christa’s idea and did just that. 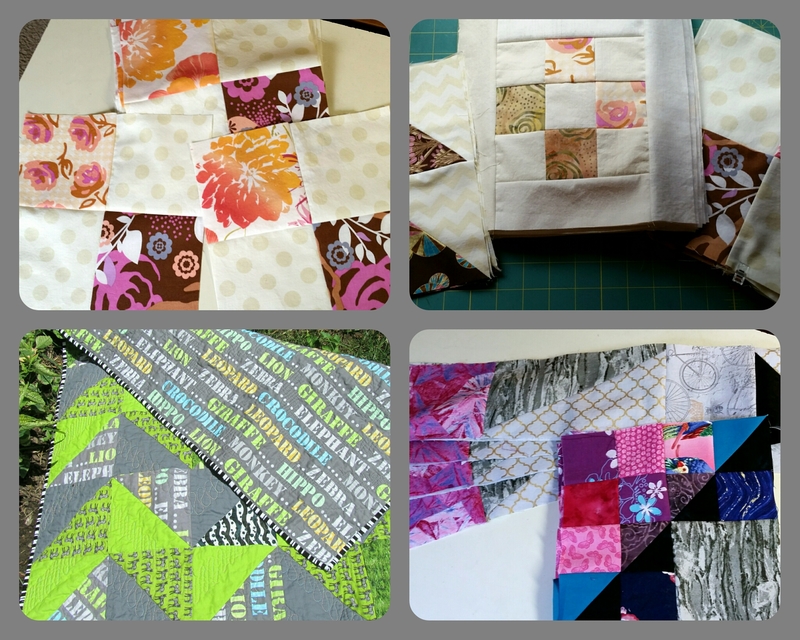 All my scraps were already 6 7/8″ in width, but short of being squares. 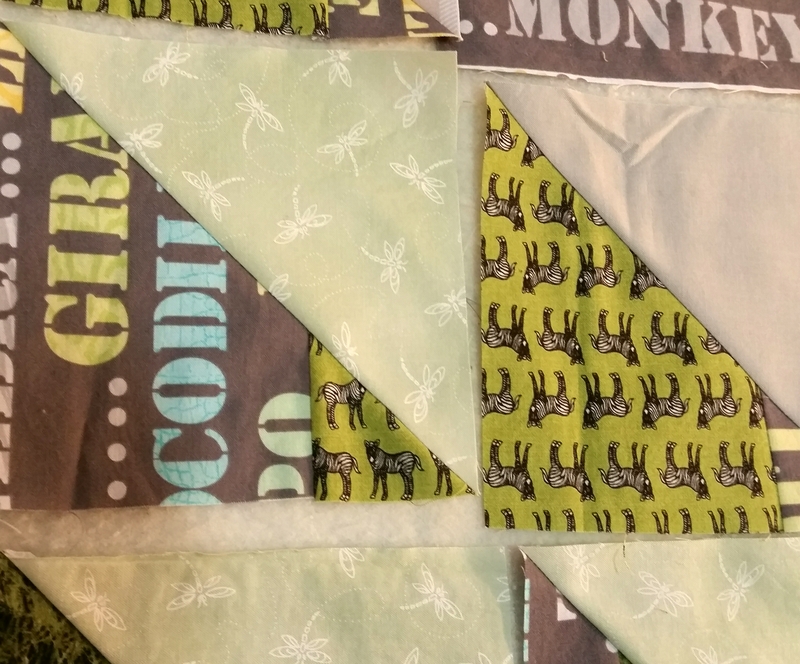 I sewed them into one long strip, then cut that into squares to make the HSTs. I paired them with pale green and gray fabrics. I like how they soften it up. I’m still arranging blocks. The lower left corner is not as dark as in the photo, but I may sub out a lighter gray.